A city full of surprises, once was divided and still feels like each area has its own color and personality. Diverse in its own self, history and development. A city with multiple identities and not one in specific. Might be difficult to find your way around at first, but it is worth exploring, getting lost, and finding your route back again. If you are like me, and wish to see everything, then prior planning is a must, this city is too big and too scattered around. Berlin; Metropolitan; and to Me; Berlin is like Blind Love. Stands for Central Berlin. Where most of the touristic attraction reside. Happening and commercial, touristic and historic. You will find: The Museum Island, Berlin Arch known as “Brandenburg Gate”, Potsdamer Platz, Reichstag building, Berlin Wall, Check Point Charlie, Berlin Dome “Cathedral”, Victory Column, Hackescher Markt, Berlin Tower, The field of Stelae, Topography of Terror. For more details on what to do and where to go in Mitte, click on the photograph below. Unfortunately, I only made it to the Mauerpark in Prenzlauer Burg, but I heard so much about the neighborhood. If you wish to experience the posh side of Berlin which used to be the Bohemian side earlier in the 1900, now you can go there to dine at expensive restaurants, walk between tree-lined streets, colorful boutiques and admire the buildings built-in the 20th century. The Maurpark on the other hand is a must visit and experience preferably on a sunday during summer time, when the biggest flea market takes place and an open public karaoke that is unforgettable experience . For more photos and details on the Maurpark, click on the photograph below. Which is just right below Mitte and is attached to Kreuzberg, is famous for its walls to be turned into canvases, even big buildings you will find art and graffiti on them. This artsy neighborhood, is also filled with cheap bars, boutiques and restaurants. 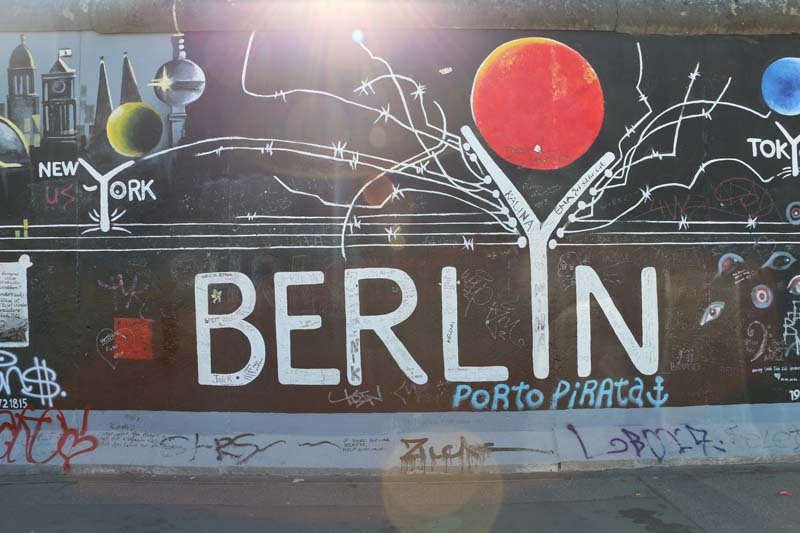 You will find the EastSide gallery, Jewish Museum, Oberbaum Bridge, and many outdoor flea markets. For more photos on the Berlin Wall “EastSide Gallery” and Friedrichshain click on the photograph below. As mentioned above is actually combined with the Friedrachshain neighborhood, is also known as X-berg, and is known to be from the trendiest areas in Berlin. Filled with bars, restaurant, and vibrant nightlife. This is where you will find all the punks, bohemian, artists and counter cultures calling it home. Filled with graffiti, art, shwerma stands, cafes and vintage shops. For more photos and information click on the photo below. This is where it is the most international, for most immigrants landed in Neukolln, and few years back, this is where all the artists moved to, because of the rise of prices in central Berlin except for Neukolln where inexpensive rents and nightlife was still available. Today Neukolln is becoming very popular and therefore prices are rising up. Neukolln is often refereed to as little Istanbul, for the many Turkish immigrants who have immigrated therefore created their turkish fragrance. Neukolln is filled with beautiful parks and many sunday flea markets along with easy-going bars that are open and easy to meet people from different cultures and have endless and diverse conversations. You will find the Berlins former airport Templehof Field that is now a public park and a hangout. Unfortunately, I didn’t make it to the park. For more details on where to go and what to do in Neukolln click on the photo below. As for Shopping try Kurfürstendamm which is considered the Champs-Elysees of Berlin. Did I miss anything? Please feel free to share with me your comments.